Where does a Dutch oven come from? This is a common question, yet not necessarily an easy answer, with a variety of answers in circulation. Although it is easy to define what a modern-day ‘Dutch oven’ is, the history of it can be a little harder to track down, as the pot going by this name isn’t actually Dutch. After reviewing various sources, we think the Dutch oven’s history can best be summarized in three distinct moments in time. These events are all key steps in creating the Dutch oven as it can be found today. 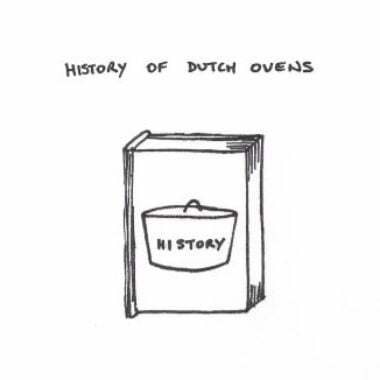 A ‘Dutch oven’ is called a braadpan in the Netherlands, which roughly translates as a frying or roasting pan. The modern Dutch design that is currently being used has transformed to an enameled steel pan, mainly used for frying meats. They are a lighter and cheaper weight steel pan to what are now considered a ‘Dutch oven’ is suitable for gas and induction cooking making it ideal for modern indoor kitchens. It looks it most resembles the heavy lidded pots that can be used on the stove top, or in an oven to make casseroles. The Dutch initially started producing their cast cooking vessels in the 17th century, creating a range of pots, pans and casserole dishes. These were initially cast of brass. Their process used sand to make the molds and produced a high-quality pot with a smooth surface, compared to the English at the time that were using loam and clay. Interested in their effective techniques, the Englishman Abraham Darby visited the Netherlands to observe this casting process. He returned to England and in trying to create a cheaper product further refined the process to use the more economical metal of cast iron. Darby eventually in 1707 patented a casting procedure and named it the “Dutch oven”, thus explaining where the Dutch name originated for this cooking pot. The Americans then brought these English pots to their new colony and continued to make changes to the English style Dutch oven during the colonial era. Paul Revere, the famous Patriot, is credited with adding legs to the pots and designing the flat lid with a ridge for holding coals. Colonists and settlers used this cookware for its versatility and durability. Famously Lewis and Clark carried Dutch ovens with them on their expeditions through the American West and it was one of the few items that they took home with them at the completion of their expedition. The Dutch oven was a prized possession, used by pioneers, homesteaders, miners, and ranchers. In 1896, Joseph Lodge built a cast iron foundry in Tennessee, where the Lodge Company still produces their famous cast iron Dutch ovens.